In March 1983, she was deputed to take over the recently opened center at Guelph, Ontario, Canada. Thus she came with a very rich academic and spiritual background, community service orientation and organizational experience. Over these years, she has been endearingly involved in every respect of life of the community – secular, religious and spiritual. She is untiringly industrious, highly service motivated, courteous, profound thinker, and a brilliant speaker. 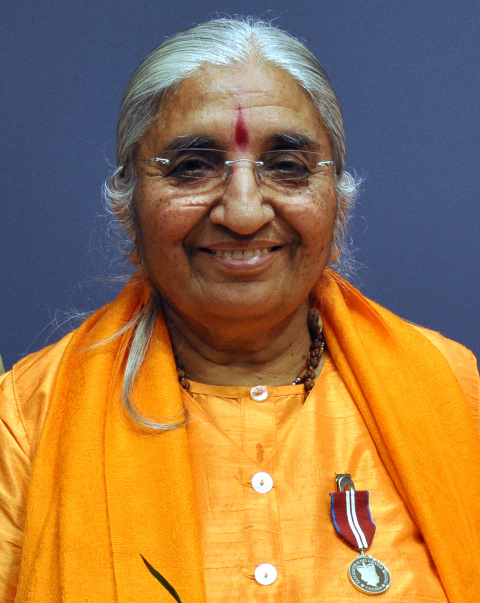 She thus won the love, respect and confidence of the people and succeeded in establishing the Brahmrishi Mission Yoga and Meditation Center with a Hindu Temple inaugurated by Brahmrishi Shri Vishvatma Ji Maharaj in July 1997. This has been a great achievement and an important need fulfilled. The community expressed their heartfelt appreciation and gratefulness. The center is kept fully busy with classes in Yoga, Hindi, Sanskrit, Philosophy, Music, holding camps for children and teenagers apart from the routine temple services, festival celebration and other special programs. This short note portrays the extent of rigorous tapascharya, vows and disciplines undergone by her over the years hidden behind her orange robes. It should inspire any one for a full complement of reverence to her and offer earnest gratitude for the selfless services being rendered to the community. We bow to you in heart-felt reverence Didiji – you are our Sanyasin Bold, with prayers for your continuing good health, long life, blessing from Revered Guruji and highest spiritual perfection. We cherish your blessing ever.